The latest collaboration project with mobile game Pocket town (ポケットタウン, japanese version) or Town tale (ตะลุยฟาร์มหรรษา Thai version), Shewsheep has become many many thing -costume, bed, book shelf , wall clock , statue etc. You can check some of interesting item in the clip and pictures down here. 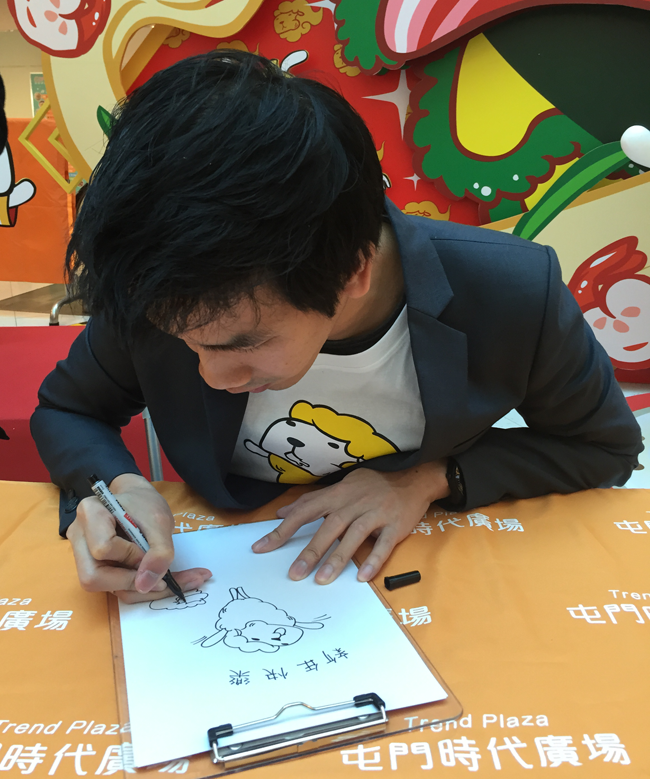 In 15-16 July 2017, Poptoday (creator of Shewsheep) take a deep breath and step up to make his first Live Drawing at Tokyu Hands Shibuya. It was challenge ,it was fun… you must be surprise of what’s the most favourite food japanese ask for. Shewsheep go to Tokyo with 6 more Thai Character friends. This year is a great year to celebrates 130 years Thailand-Japan Diplomatic Relationship. Follow that Shewsheep has a big chance to grab on a TukTuk(Thai Taxi with 3 wheels) with Thai characters friends to celebrate this event with a pop-up store in Tokyo. Tokyu Hands is a variety store (I’m not sure that I said it right , but they sell almost every thing here) that invite us to open pop-up store in their space to sell Shewsheep products and also collaborates on making new limited item for this event in July-August. It was like our dream come true that we have this surprisingly project. This café come from the idea of COTTO to give something fresh to customers and people in Siam Square – the main shopping area in Bangkok. COTTO has contact us to design the previous COTTO concept store into a character café with Shewsheep – the Eat All Day Sheep which we are very happy to join not only a chance to try something new but also a great opportunity to give a new experience to our fans. Eat All Day Double Pancakes – Classic pancake menu with maple syrup and butter added by tasty Thai mango which surprisingly delicious mix up. Heavy Weight Tiramisu – Soft and smooth with heavy taste and chocolate sauce. At the café we have designed many spot to let customer have fun to take a photo or even selfie such as Hall of fame corner that collect some hilarious gag from facebook page to show here, Shewsheep big size that will sit around at many table wait for you to cuddle, 40 actions chairs – every chair has an unique emotion of Shewsheep on the back come and find which one is your favourite, etc. Eat All Day Café at Siam Square One will open from 1June – 31August 2016 . If you have a chance to stop by or shopping at Siam Square please come and have fun. 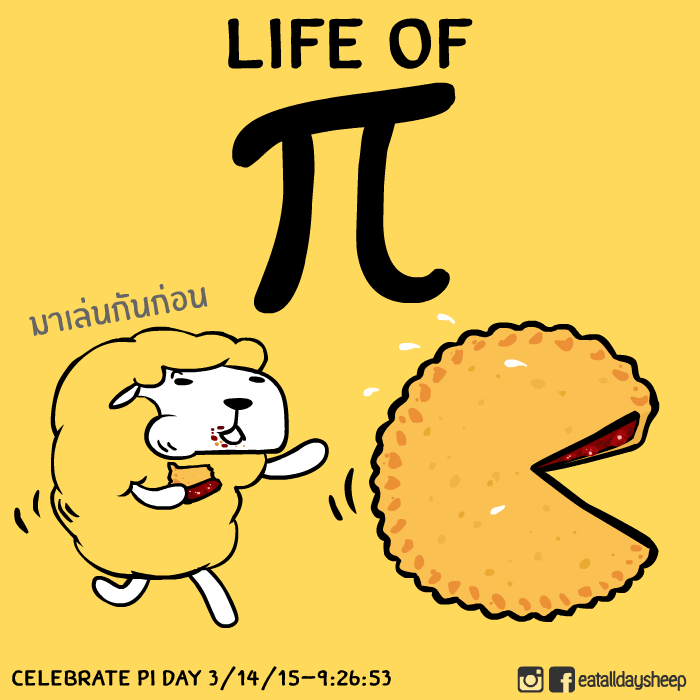 Let’s celebrate an Ultimate Pi Day that’s once in century. This day that we have 3/4/15 9:26:53 definitely complete our Geekdom. Join me and celebrate the π day!! Oh wait up Mr. Pie!! Full of life , full of money and full of food in your belly. January 22th, 2015 was one of the most important and exciting day in my life. 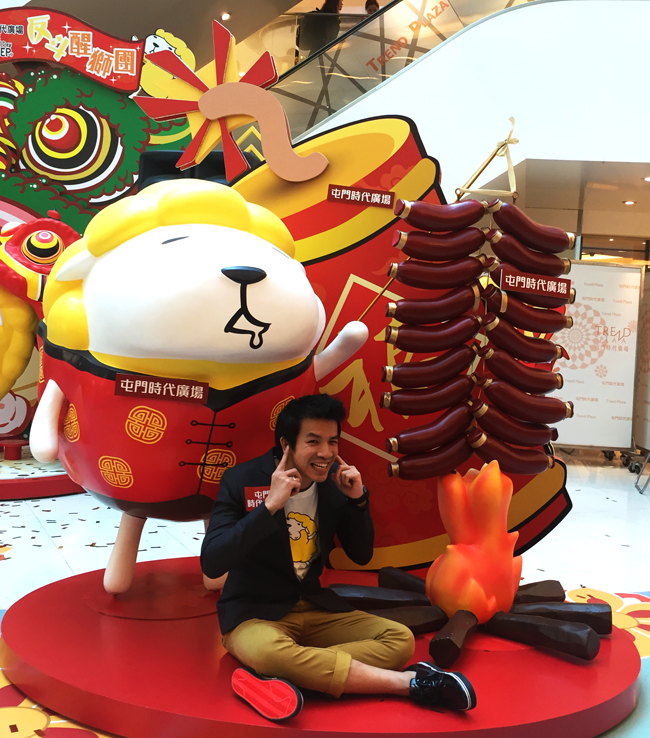 After these past two years that the yellow sheep, Shewsheep of Eat All Day (www.facebook.com/eatalldaysheep) has been a familiar face to you, he is now introduced to new friends in a new country. 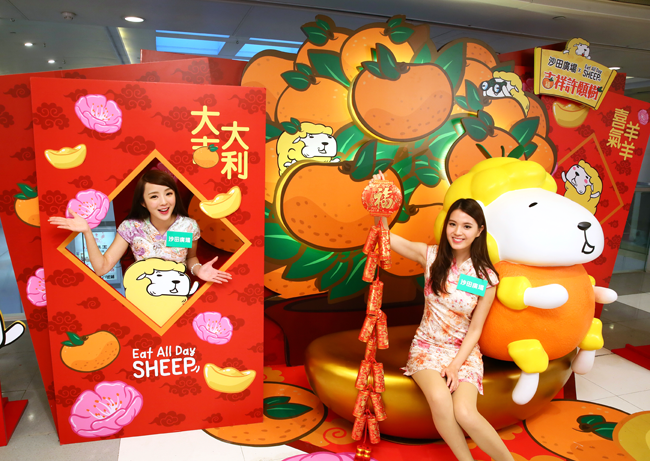 While this year is a ‘goat year’ in Thailand, in Hong Kong and Japan have is known as a ‘sheep year’, and Shewsheep has been chosen to feature in a Chinese New Year celebration with the Henderson Mall Group in Hong Kong throughout this February. 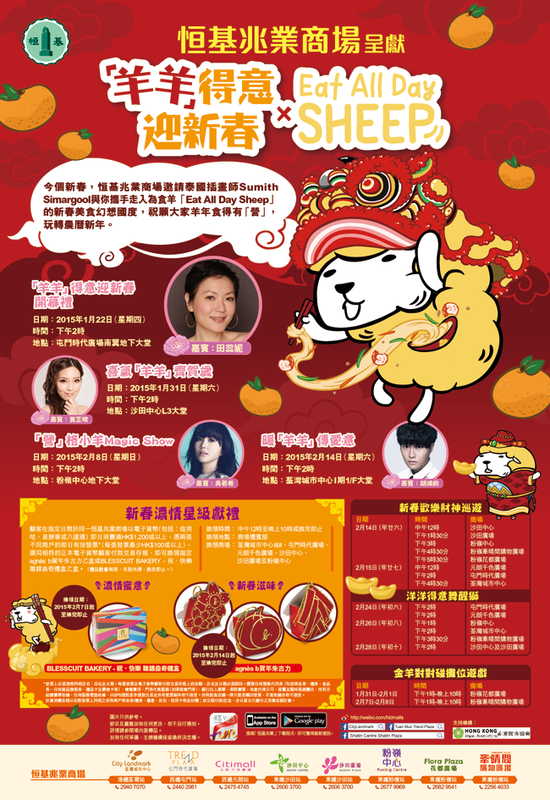 There are 8 malls participating in this campaign which are 1.Tuen Mun Trend Plaza 2.Tseun Wan Citi Landmark I&II 3.Fanling Center 4.Fanling Dawning Views Plaza 5.Fanling Flora plaza 6.Shatin Center 7. Shatin Plaza and 8. 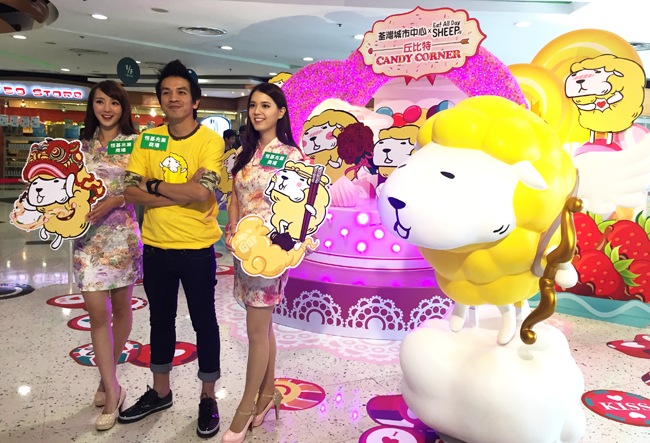 Yuen Long Citimall; you will have Shewsheep greeting you from the entrance of these participating malls. 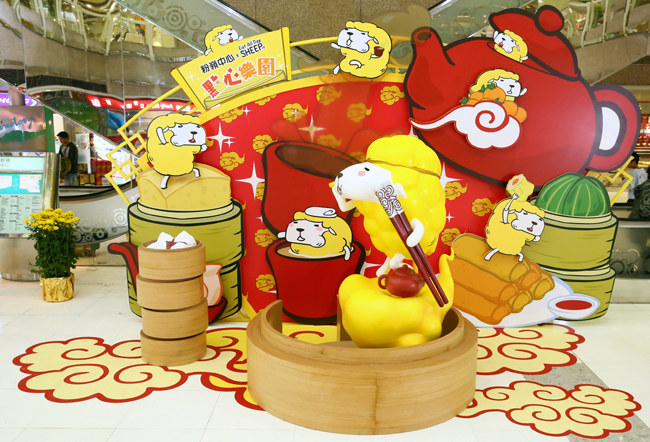 Once you enter the mall, you will meet Shew Sheep in special Chinese New Year theme such as Shewsheep in a lion dance parade, Shewsheep in a chinese outfit lighting sausages firecracker, Shewsheep in an orange (auspicious fruit), Shewsheep as monkey king (from Xī yóu jì) riding a golden cloud along with a gigantic dimsum set, and also Shew Sheep as a cupid welcoming you into the Valentine’s vibe. A warm welcome with his Lion Dance. 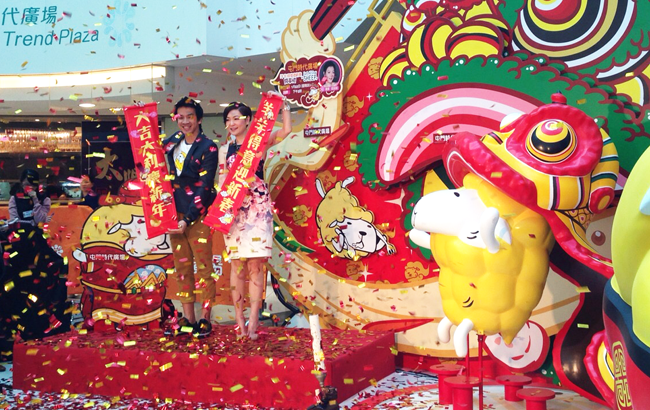 On the day, not only Shewsheep was joyfully introduced to the Hong Kong’s public, but I was also invited to present the opening ceremony with a famous Hong Kong actress. I did not know that I would be so nervous as I really was, I even jumped a bit when the paper shoot confetti was blown out and covered the whole event hall! 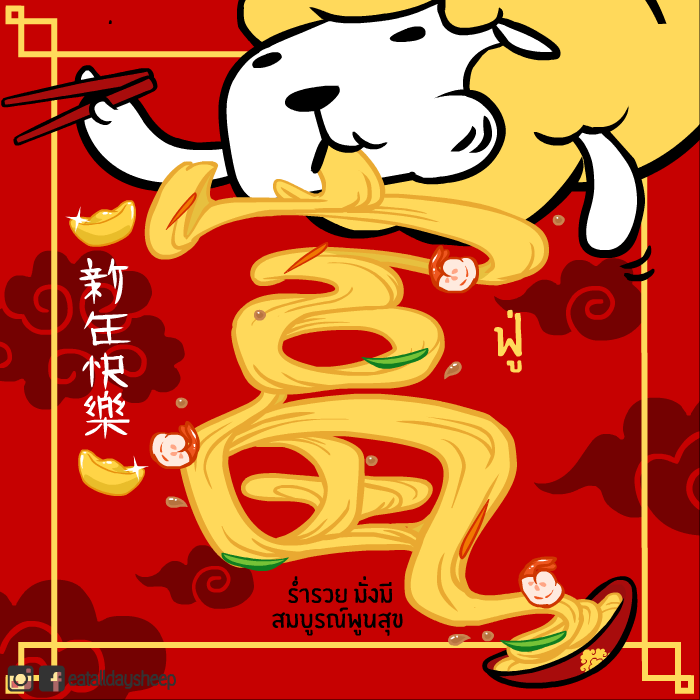 Apart from the Shewsheep decorations, I got a chance to draw a Chinese New Year greeting card in the event as well. 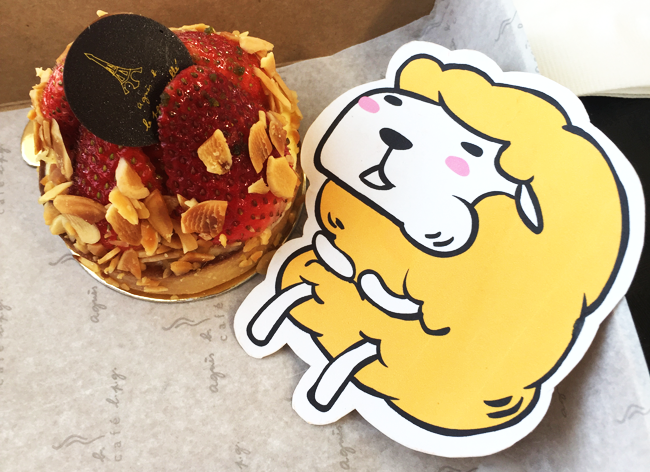 Another happy moment was that not only Shewsheep was a likable character to the Henderson Mall Group, but they loved his eating characteristic as well and developed the eating concept into a Gourmet Theme Park, in which Shewsheep will appear on various food recommendation sign in these 8 malls. It’s time to celebrate. Light it up!! Shewsheep as a cupid is on duty. And dimsums are ready to serve. 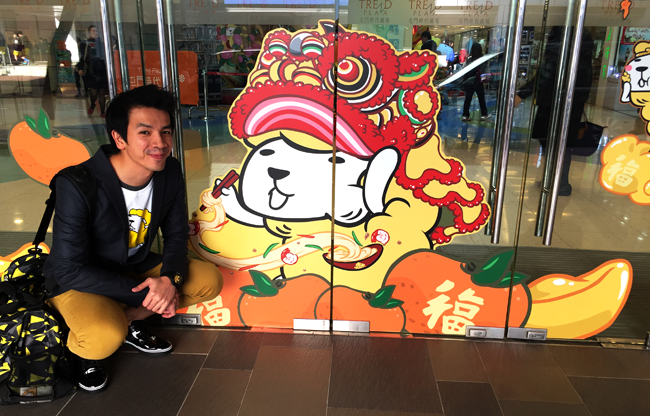 At Shatin center Shewsheep had too many oranges ,so he became an orange. Apart from the event, there were photo sessions and interview sessions with various media press. The press were not only interested in the Eat All Day sheep, but also in growth and variety of Thailand’s character design industry and Thailand’s animation industry. The press were especially interested in our Thai New Year festival(Songkran). They questioned about our special ceremony or special ‘thing’ that we do on Thai New Year, its history, its tradition, its activity, and special food during the celebration. It seems very much in Hong Konger’s eyes, Thailand is quite an interesting country. Writing “Happy New Year” for the press. Good bye Hong kong with fantastic dessert, and hope we meet again. 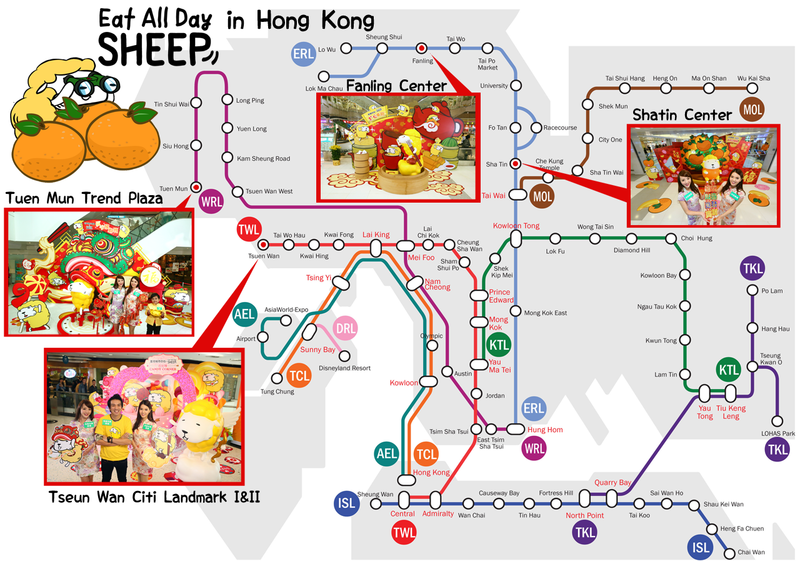 If anyone get a chance to visit Hong Kong during this February, you can visit Shew Sheep in 3D at these malls in the New Territory : 1.Tuenmun Trend Plaza 2.Tseun Wan Citi Landmark I&II 3.Fanling Center 4.Shatin Center (with MTR map below). If you get to take a couple photo with Shew Sheep, don’t forget to share with us!